This fabulous sign was created at the very beginning of the twentieth century, and captures a moment in time when a motor pit and stabling deserved equal billing. In fact, it's so good that I'm ignoring the fact it's not technically a ghost sign: it isn't painted, but made of raised lettering on terracotta. 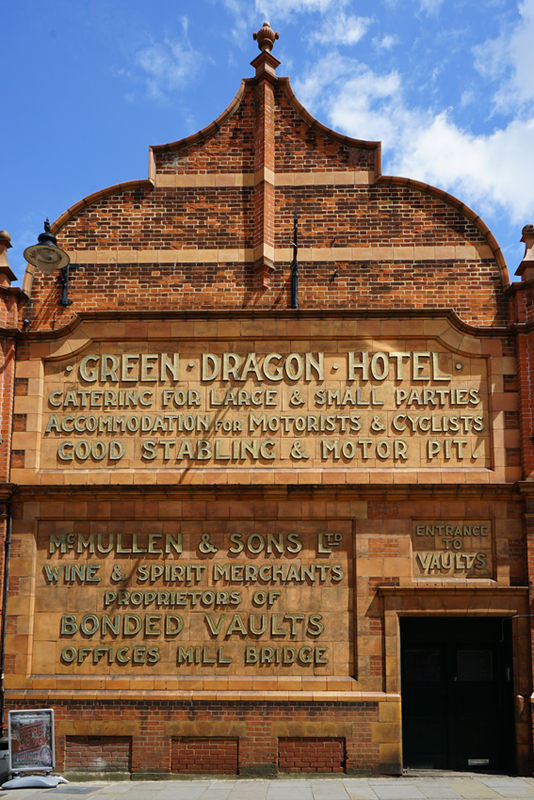 The Green Dragon pub dated back to the 17th century, but the current building was erected after a fire destroyed its predecessor in 1903. It had 25 rooms, as well as hosting the meetings of various local associations: as the sign boasts, it could cater for 'large & small parties'. The stabling, motor facilities and brewery vaults were in this separate building in the hotel yard. The sign informs us that there were facilities for cyclists as well as motorists and horses; the need for a motor pit is a reminder that cars were rather less reliable in those days and repairs a frequent necessity! 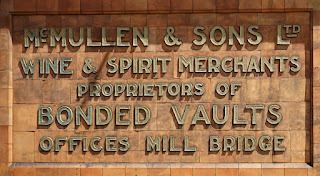 The building was owned by McMullen's, who had bonded vaults there, their doorway clearly marked. 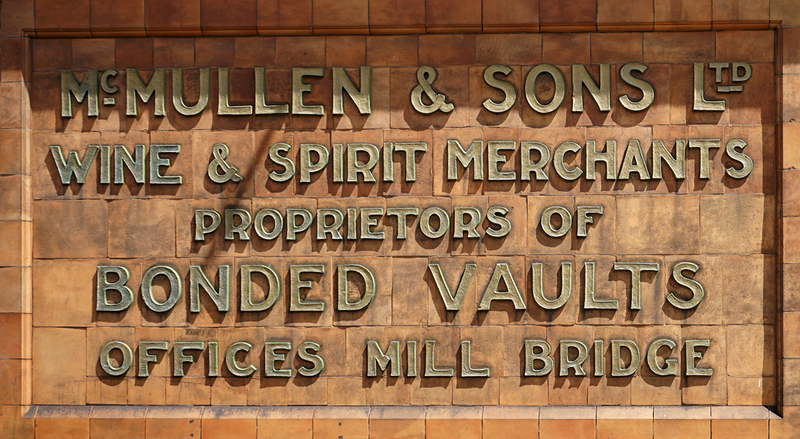 McMullen have been brewing in the town since 1827 and are still going strong. They also own a number of pubs and, as the sign reminds us, acted as wine and spirit merchants too. This sign is a wonderful reminder of the past, and is listed so should be around well into the future. Thanks to Peter Berthoud of the excellent Discovering London guided tours for showing me this sign! I really need to get to Hertford as it's just down the road. Do you know St Albans? 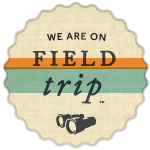 You might be interested in this post I wrote a couple of months ago. I'm fascinated about "ghost" pubs too. Thank you - that is interesting. 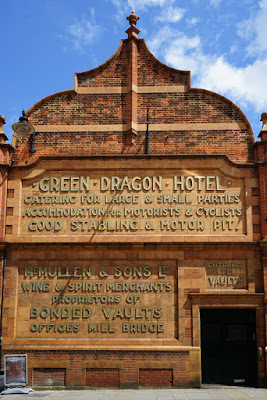 I don't know St Albans, but must visit - and look for the wonderful ghost sign you include.